Scholastica helps editors of law reviews manage article selection, as well as publish articles and issues online through Scholastica. Scholastica works with all kinds of journals and can be configured to support your law review’s unique workflow. As an editor, you will be able to receive, organize and assign submitted articles to your team using Scholastica's tags, filters and notifications. You can easily add files and manage versions of submitted articles all in one place. To learn how to do all that and more, please read the guide below and check out our Law Editor Learning Center. If you're taking over for the previous board and you'd prefer a video overview of the steps to take to update your law review account, you can watch here! Giving your team access to the Scholastica account so they can start poring through submissions is easy! On Scholastica, an “editor” is someone who has access to all of your submissions and has the ability to: self-assign articles, fill out your review rubric, and read other editors’ reviews. On Scholastica, a “reviewer” is someone who can only see the submissions they are assigned, cannot see each other’s review rubrics, and cannot communicate with authors. To invite your team to Scholastica, the admin editor of your law review’s Scholastica account will go to My Journals > Editors then click “Invite New Editor” > “Invite via email”. 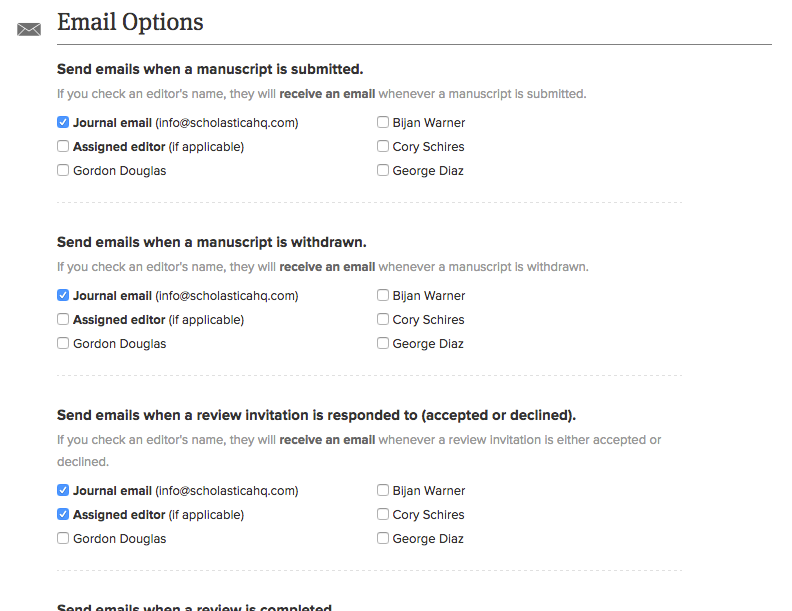 You can invite your entire article selection team at once by entering their email addresses as a comma-separated list. Then simply pop in a quick letter explaining that they’ll need to accept this invitation and sign up in order to access the Scholastica account. Going to My Journals > Manuscripts then clicking the title of the manuscript you’d like them to review. Clicking “Non-Scholastica User” to invite that editor for the first time. If they have written a review for you, that reviewer’s profile will appear under the “Past Reviewers” tab. Entering an invitation message, selecting a deadline, and clicking “Send invitation"
NOTE: You can input a reviewer invitation message in the templates section on the right to save yourself time! The previous board has handed over the reins to you - congratulations! Now you’ll want to ensure that they no longer have access to sensitive information like author manuscripts since they are no longer an active board member (and because they don’t want to keep getting emails from Scholastica!). Scholastica has flexible configuration options to ensure that your law review can operate in a way that works for your team. A few of the settings that your journal admin will want to consider tweaking are listed here. Save yourself the tedious task of ensuring that each and every manuscript has an editor assigned to it by enabling "auto assign" in your configuration options. When your journal's administrator has enabled this option, as manuscripts are submitted, they are automatically, evenly distributed between the editors that your admin has selected. From your Dashboard, click My Journals. Scroll down to Workflow Options. Click the checkbox next to each recipient who should or shouldn’t be automatically assigned articles as they are submitted. Click Update Journal to save changes. Many actions within Scholastica will generate email notifications. In this section, your journal's administrator can determine which actions send emails and to whom. Click the checkbox next to each recipient who should or shouldn’t be receiving emails for each action. 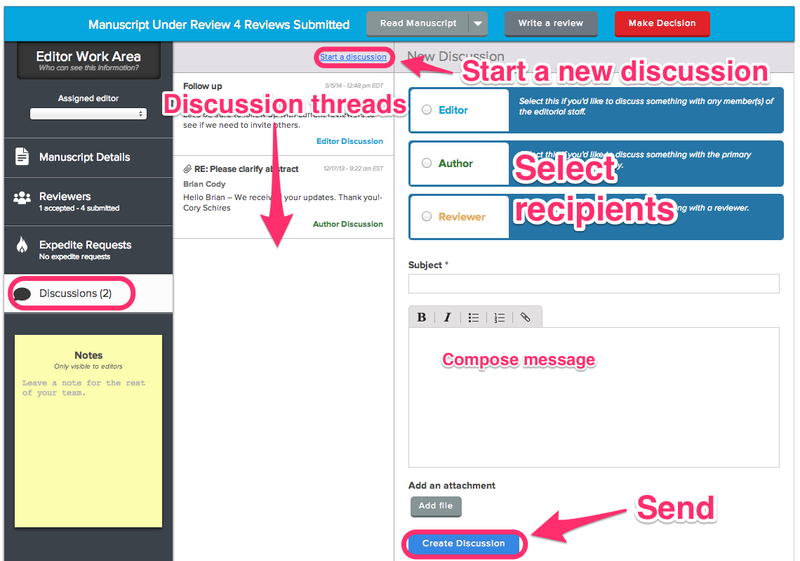 The admin editor can open and close submissions to your journal in your journal’s Settings. Un-check the box next to "Suspend submissions for this journal." Scroll to the bottom of the page and click Update Journal. 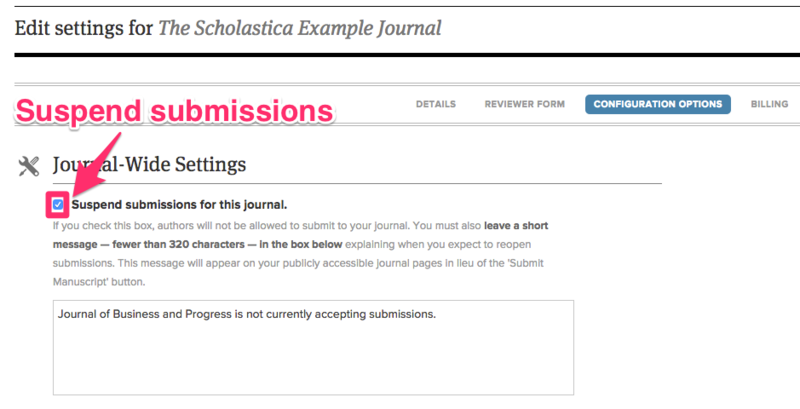 Check the box next to "Suspend submissions for this journal” and enter a message to explain when you’ll next be accepting submissions. When submission season rolls around, you’ll want to ensure you have the most up-to-date information available for authors. Why? Because authors read the information that you have listed! Authors click “Guidelines” to read the information you have posted on your “For Authors” page when they’re preparing to submit. The admin editor will go to My Journals > Journal Profile then click edit page in the grey toolbar on the left to edit the current page. Make it easy for authors to submit to your law review (and reduce the clutter/confusion coming into your journal’s email inbox!) 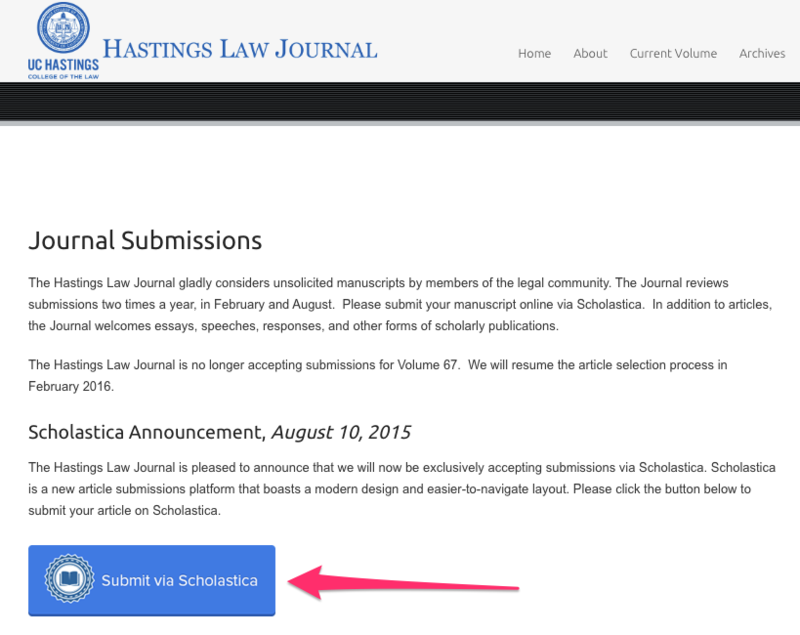 by adding a Submit via Scholastica button to your law review’s website. Send the code to your website’s manager to add to your submissions page! When you first log into your journal account and head to the Manuscripts table, you may be dismayed to see that there are already manuscripts in there, possibly from last year or older. How do you get rid of the old manuscripts? Just 1. Reject them and then 2. Filter them out. ​​If you don’t make decisions on old submissions, you won’t be able to move as efficiently through your new submissions. It is easy to clear out old submissions, and you can either reject several manuscripts at once or, if your account is still closed for submissions from last time, you can reject all manuscripts that are still “under review”. Authors want decisions and they respect law reviews that have the courtesy to give them a rejection rather than radio silence. Don’t believe us? Read for yourself. Once you’ve given every old article that was "Under Review" a decision, you can then use the manuscript table’s filters to only look at newly submitted articles. This section gives an overview of how Scholastica helps editors organize, access, and take action on manuscripts submitted to their journal. By default, the list of manuscripts will be sorted by submission date with the most recent at the top. Read more: What does the manuscript status mean? Read more: Can I hide a manuscript from another editor? Manuscripts can be filtered by their status, review condition, and which editor they are assigned to. ​​By default, the filter tool is set to: Show me all manuscripts assigned to anyone. The all field can be set to all, under review, accepted, inactive or late. The anyone field can be set to anyone, no one, or an individual editor. The with a review status of field can be set to 1-3+ reviews submitted, late reviews, no reviewers invited yet, pending reviews, and unanswered invitations. Manuscripts can be searched using the search bar. Type a query like an author's name, a manuscript's title, or tags; the manuscript table will automatically update to accommodate your search. Manuscripts can be sorted by author title, assigned editor, submission date, status, rating or expedite request date. To sort by any of these fields, click the top of their respective column. Click the column again to reverse the order. Click on a manuscript's tag to see all other manuscripts with that tag. How do I add tags to a manuscript? How do I manage manuscript tags? Message recipients receive an email notification of the message and can respond via email, without needing to log into Scholastica. To learn more, read How do discussions work? Messages go to the email address in the "Email" field. If an author receives a publication offer from another law review, they can send an expedited decision request message. Editors will receive an email notification of this request if that setting has been toggled on under Configuration Options. The email will have the article and author information, as well as the name of the law review that has made them an offer and the date by which the author is requesting a decision from your board. 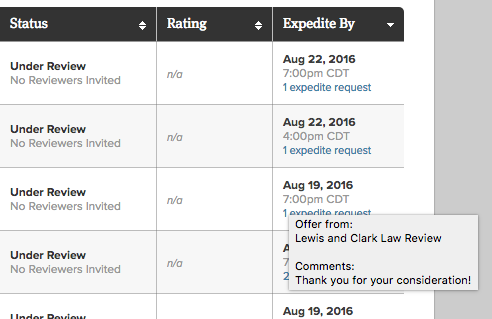 Expedites are also viewable under "Expedite Requests" in the manuscript work area. The priority deadline is listed on top with the expedite request's history below. If your law review collects standardized feedback about articles from your editors, then you’re in luck! 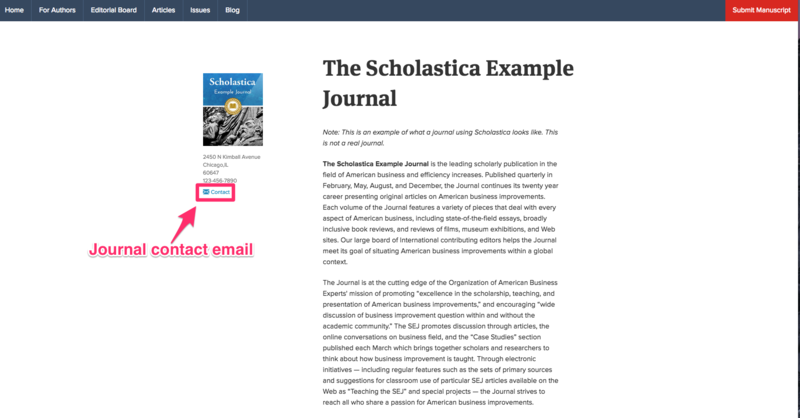 Your team can read submissions, leave their review of the article, and organize their chosen articles all on Scholastica. Note: Any user who fills out the review form will be labeled a reviewer (even if they’re also an editor). When you invite an editor to provide feedback on a manuscript, they will be prompted to fill out a review. 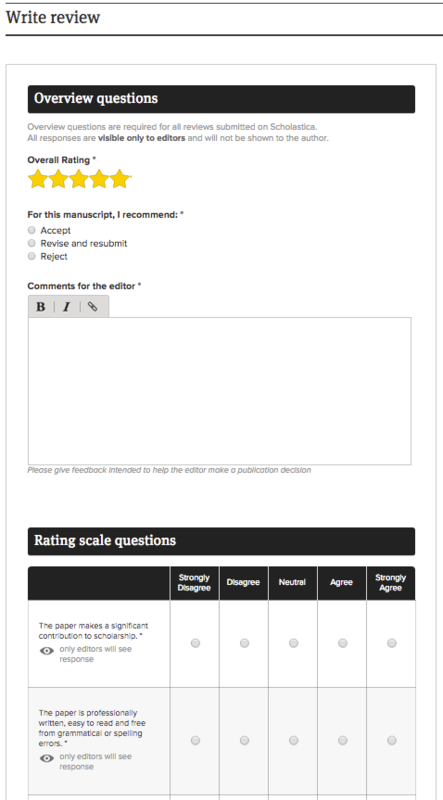 The Reviewer form is structured to standardize feedback from your editors and can be customized for your journal. Learn how here. How do I write a review on Scholastica when I have editor access? Going to My Journals > Manuscripts then clicking the title of the manuscript you’d like to review. Clicking Read Manuscript to read the manuscript and then clicking the grey Write Review button when you’re ready. Clicking “OK” on the pop-up that appears to confirm that you’ll be assigned as a ‘reviewer’. How do I write a review on Scholastica when I've been invited as a reviewer? If you do not have editor access on Scholastica, you'll need to follow the steps in this guide to learn how to accept your reviewer invitation, set up your account, read manuscripts, and write your reviews. Please reach out to support@scholasticahq.com with any questions! 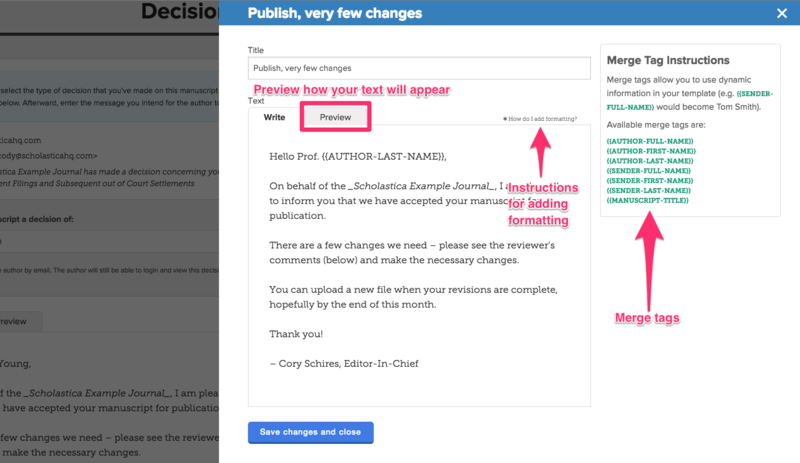 Scholastica provides tools to help editors communicate the journal's final publication decision to authors. 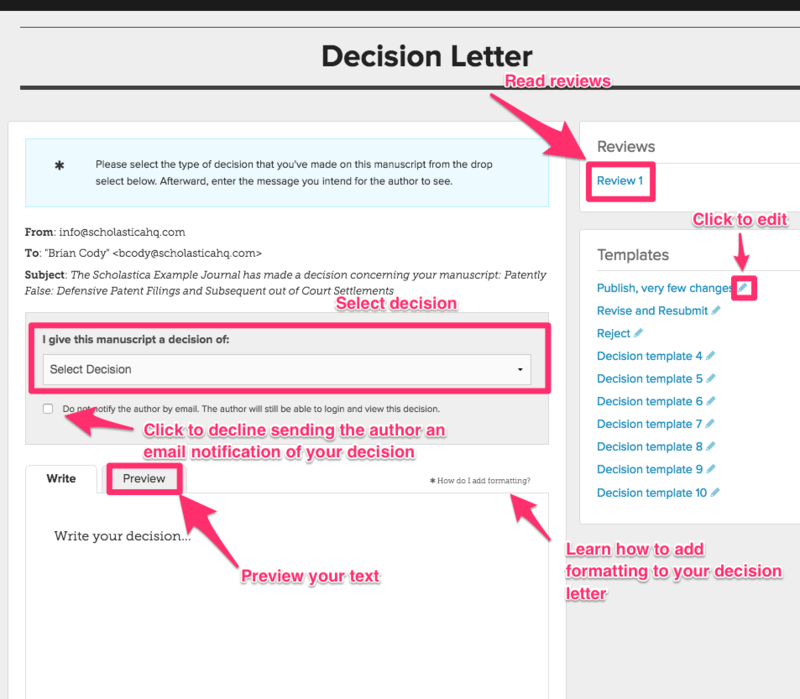 Once you are ready to make a publication decision about a Manuscript, Scholastica allows you to notify the author of said decision. From the drop select, choose Accept or Reject. Enter a message to the author either by typing a new one, or by selecting from your saved decision letter templates. Select whether the decision should be shared with the author immediately or in two to five days and if an email should be sent to the author. Click Submit decision (NOTE: the decisions are final and cannot be undone). Read more: Can I change a publication decision for a manuscript? Scholastica allows editors to create template letters that will automatically fill in the author's name and article information when making a decision. 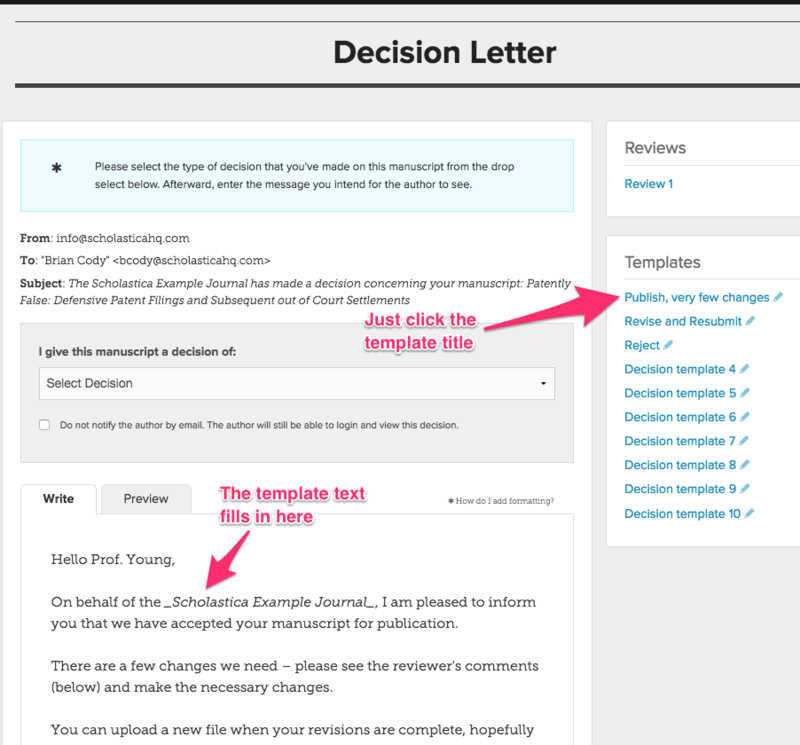 On the Make Publication Decision page, use a saved message template by clicking its name. Edit a saved template by clicking the small pencil icon. Make a new template by clicking the small pencil icon next to an unnamed decision template. Use merge tags to include dynamic information in your template. Scholastica will automatically fill in those values for a given manuscript. Click Save changes and close. Law reviews are configured, by default, to give authors that have had their articles accepted by law reviews the option to accept or decline the publication offer. When making the decision and extending the publication offer, the editor can enter the deadline by which the author must accept or decline the offer. Until an offer is accepted by the author, the manuscript will appear as "Accepted Pending Publication Offer" in the list of manuscripts. When an author accepts a publication offer the editor will be notified by email. Learn more about publication offers here. Decide who should have editor privileges in Scholastica. Only people that you want to be able to access any article and have the capability of making publication decisions should be given editor privileges. Note: your journal's account administrator can make changes to editor privileges. Use reviewer invitations. You can invite a person to review one specific article without making them an editor, and in doing so you will be able to set a deadline for the review to be submitted and track that deadline to make sure it gets done on time. This also allows you to limit the number of people who can make publication decisions to only the core group of editors that you give editor privileges. Use tags to group manuscripts. Tagging articles allows you to create ways of organizing manuscripts to match your workflow, and tags are only visible to editors of your journal. If you have three tiers of review, using tags like "first read" and "final read" allow you to search the manuscript table and only see manuscripts with those tags. Read more: How do I add tags to manuscripts? Select categories for your journal so that authors with relevant manuscripts can find you more easily. Read more: How do I select specialized law categories for my journal? Do NOT...create fake user accounts for your journal (e.g. "Law Review Editor"). Journal accounts can be transferred to another editor whenever the editorial board switches over, and using only real individual accounts allows you to use Scholastica's powerful built-in analytics. Do NOT...wait until the end of the submission cycle to accept/reject articles. Authors have told us that they love when journals give them decisions, and don't like when they never hear back from a journal. Read more: How do I reject remaining manuscripts when I am done selecting articles? Do NOT...ignore analytics. Journals can set goals and track their progress. For example, a journal could aim to make decisions on all articles within 3 weeks, and then use the built-in analytics to see how successful they have been at reaching their goal.